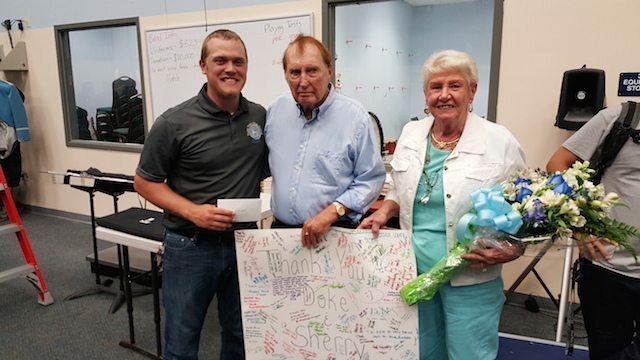 The Ponte Vedra Ocean of Sound Marching Band received a generous donation from local residents, Duke and Sherry Horner, to help purchase uniforms. The generous benefactors presented a $20,000 check to band director, Jakob Wisdom, at the band’s pre-game warmup. The check came with the offer to match fundraising efforts made through January in order to ensure the band reaches its’ goal to have uniforms for the 2016-17 marching season. Mr. and Mrs. Horner have lived in Ponte Vedra Beach for 60 years. Mr. Horner served in the military and Mrs. Horner was one of the founding members of the Ponte Vedra Women’s Club. Their children had to be bussed to the local high school in Jacksonville Beach so they are thrilled that their granddaughter is able to attend Ponte Vedra High School and be part of the marching band. Though Ponte Vedra High School opened their doors in 2008, due to lack of interest the band was not formally organized until 2012. Since it was not included in the initial budgeting the funds were not earmarked for the program which is a major factor in the lack of funds for the band. This band has struggled not only with funding but with leadership until Mr. Wisdom took the reins as the 2014-2015 school year began. The uniform drive is the realization of a dream for so many students and families both past and present. The band booster club fundraising will begin when Ducky Derby tickets going on sale September 19th with students at various Publix stores and Winn Dixie in the Ponte Vedra Beach area. There will also be a Table 1 event on October 1st. With the generous benefactors and the efforts made by students and parents, the Ocean of Sound Marching Band will be taking the field next year in new uniforms.